When I heard that Comedy Central kings Keegan-Michael Key and Jordan Peele were going to be writing and starring in their first feature film together, I thought that we would be blessed with comedy gold. Best known for their viral sketches, Key and Peele are masters of comedy, so making the switch from TV to film seemed like a smart move. When I heard that their film would be about a kitten, I immediately thought that they could be making a terrible mistake. Upon watching the trailer, I knew Keanu wasn’t going to be the best start for the duo. Unfortunately, the film turned out to be super cute, but it didn’t bring the laugh-out-loud humor we are used to seeing from Key and Peele. 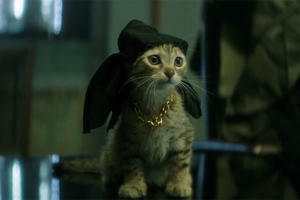 The story for Keanu is quite ridiculous, as two cousins attempt to act like gangsters to get an adorable kitten back. One morning, Rell (Peele) opens his door to find a tiny kitten sitting on his porch. He immediately adopts the kitten and spoils him. Two weeks later, his house is mistakenly broken into, and the robbers take Keanu. Rell is heartbroken and turns to his cousin Clarence (Key) for help. The pair learns that a local gang has taken Keanu, so they pose as the city’s toughest killers to join the ranks and win Keanu back. In such a ridiculous story, something had to give to make it reasonable. Thankfully, Keanu was the solution. I’m sure everyone agrees that the tiny kitten is beyond adorable and is certainly the highlight of the film. The poor kitten is slightly tortured when Rell decides to make a calendar of photos with Keanu dressed up and acting out scenes from famous films. Anytime Keanu was dressed up, I couldn’t help myself from saying, “Aww!” The kitten’s antics and outfits are by far the funniest, and cutest, parts of the film. It’s great that the film had a cuteness component, but for a comedy, where were the laughs? The tempo was all over the place, which brought down the overall enjoyment level. There were three scenes that were extremely funny, which all dealt with some great cameos. When Key and Peele were on the screen together or with the gang, they had a hard time keeping the natural laughs going. They were trying to force poorly written jokes on the audience, which I didn’t think was successful, but when they took a step back and allowed themselves to act normally, the comedy flowed. That’s my problem with Keanu: Key and Peele both tried too hard to make jokes. They are naturally very funny men, so they need to relax and be themselves more on the screen. It can be hard for sketch comedians to make the leap from TV to film, so it’s not surprising that they are off to a bad start. There have been plenty of Saturday Night Live cast members that have failed to make the transition. To be successful in filmmaking, Key and Peele are going to need to create a much better concept, story, and humor to showcase their talent. Otherwise, studios won’t fund their projects, and people will stop wanting to watch. I think that they will eventually strike entertainment gold again, but it may be awhile. Interestingly enough, audiences and critics have very similar approval ratings for Keanu. According to Rotten Tomatoes, the film received a 77% certified fresh rating. In total, 89 of 115 submitted critic reviews said that the film was fresh, which is extremely surprising to me. Professional critics typically tear a film like Keanu, and any comedy for that matter, to shreds. They usually don’t like dumb, meaningless humor, which is all Keanu provides. Usually, the audience score is a lot higher than critics’ scores for comedies, but that isn’t the case here. Out of 14,051 Rotten Tomatoes users that rated Keanu, only 67% liked the film. The film also scored 7.1 stars out of 10 from 3,667 IMDb users. Audience approval usually matches high marks from critics, so this is an interesting case study. Critical praise couldn’t save Keanu at the box office either, as the film only grossed $9.4 million in its first weekend, according to Box Office Mojo. Keanu opened on Friday, April 29, one week ahead of Captain America; Civil War. A large second weekend drop was expected, but the 65.2% drop that it experienced was massive. As of May 10, Keanu has grossed $16 million domestically. The film hasn’t had a full international release yet, so the film has potential to still make back its cost. Keanu is estimated to have cost $15 million to make, but once you add in the marketing and promotional costs, the film is not yet profitable. With these lackluster numbers, the audience has spoken, and the words aren’t very pretty. With a huge second weekend drop, my best guess is that the word of mouth has been poor. Even though it faced stiff competition, one would think that Keanu could generate more than $3.2 million in its second weekend. Key and Peele have a tough journey ahead of them if they want to pursue careers in film. Hopefully, their next live-action film will be much better than Keanu.